The massive, cat-loving wife of Lord Groan and mother of Fuchsia and Titus, Gertrude has no great affection for her family. "She's not vicious or cruel -- merely weary of her royal role. Nevertheless, it is Gertrude who first identifies the threat Steerpike poses to the traditional order of Gormenghast. Malcolm McKay's scripts first persuaded Celia Imrie to take on the role. "I just knew it was a cracking good part. It's wonderful to be able to do something that is absolutely not a costume drama. It is so completely different." No one could accuse Imrie of predictability. In the last two years, she has starred in such diverse shows as Victoria Wood's Dinnerladies and Star Wars: The Phantom Menace. 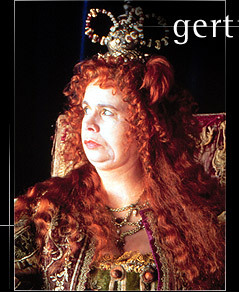 But she will never be less recognizable in a role than she is playing the gargantuan Lady Groan. And that suits her fine. "The descriptions in the book are so brilliant. He talks about her blurred profile, her thick neck, and her mountainous body. After two hours of makeup every morning, I didn't look like me at all." The mother of a young son, Imrie had no hesitation over the difficult prospect of playing Lady Groan. "She is shockingly unmaternal. It is quite a difficult thing to play, because your natural instinct as a mother is to care for a baby. Her face gave nothing away; she was expressionless. Her voice was cold. That part of it has been hard to do, actually, as a mother." -- Titus Groan, "Tallow and Birdseed"